It's been a crummy year for blackberries. Not enough heat, maybe, or then too much. 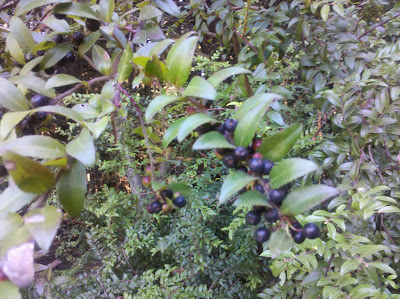 On the up side, the huckleberries have been amazing this year. Sorry for the picture quality, but this was taken with my cell phone. Huckleberries usually range from about 1/8 to 1/4 inch long, but these are the size of small blackberries. I've been picking every time we get out into the areas these berries grow. Last Thursday I even gave up my weekly allotment of talking to grownups to go and pick a couple of quarts. Then there's the tedious picking of every. single. stem. I like my berries clean, clean and frozen. A good handful on my morning oatmeal is a great way to start the day. I even have enough to contemplate huckleberry jam, but I think not. I'm pretty excited about the whole thing, though. A really bright spot in my season. At home, the tomatoes are cranking out. There's even a crock pot full of oven-roasted sauce reducing on the counter. Good times in and out of the garden. Or for us, weatherwise, it's the beginning of hotter weather. Even though this has been a ridiculously cool summer, the hours were long. It always seems to confuse the plants a little when it's hot but daylight hours are waning. Or maybe it's just me who's confused. I always think these pictures seem utterly chaotic, but they are clickable to enlarge. In the first one, the more western side of the yard, you can't see the dying Elephant Heart plum tree, but you can see the grape vine (time to harvest! ), and the mostly-dug potato bed, and the bursting-with-bells pepper bed, and the foolishly large sunflowers. What you can't see is the kale behind the sunflowers, and the used to be carrot bed. One day when I let the chickens out and forgot about them was enough to undo the painstaking sprouting I'd managed for them. So I'm torn. It's too hot really to try to get them to sprout now. Do I leave it or work to find another substitute? I'm dealing with this all over now. This one has, believe it or not, even taller sunflowers. They're epically silly, and the only one the squirrels have found is an ornamental one. I'm willing to give up one or two! In this bed, from the back, pole beans and bush beans just coming along now, with a bed of Yukon Gold potatoes from the store behind them, an emptyish bed with clover and younger sunflowers in it, the paste tomatoes, the Early Girls and basil, and the dying summer squash/winter squash in back -- the butternuts look great, but not as productive as I would have wished! -- and there's a bed of teensy direct-seeded lettuce behind the sunflowers, along the fence. I'm giving it lots of TLC with bathtub water and hope they'll make salads soon. Visually behind the tomatoes and to the left of the sunflowers is a new seeding of onions. I checked Golden Gate Gardening and she said August would be okay, so we'll see. I'm not sure they're going to sprout, though. I think the volunteer is a triamble squash, or maybe a Marina di Chioggia. Something big. I'll let it go because it's a lot of food if they set fruit. I've never gone without food, and the garden really fills in most of our produce needs, but I have now encountered two people with not enough food to feed their children in my town. Both, unsurprisingly, were/are women going through divorce. I don't know the details of their financial situations, but I'm really glad I have extra food outside and put up to share. So that's why I'm letting any winter squash go right ahead and make more food. I feel productive, too. But not as productive as these girls. They're loving the sunflowers from early morning to late evening. I'll have to squeeze in another honey harvest within the next two weeks. But I do have troubling open spots in the garden. Too hot to start seeds, possibly too hot even for buckwheat or other cover crops. I'm torn between trying to get seeds started, even though it's almost a fool's errand to try to keep them wet enough, or just forking some compost over the tops and throwing some sort of mulch on there. I have some finished compost and more bunny poop. What do you think? I don't like bare ground; I have some time I'm not going to be gardening, but when I get back to it in mid-October, I don't want it to be all death out there. Any ideas for odd-season bare ground?